Today is the international trans prisoner day of action and solidarity. If you are on the front lines, doing this work every day, then Jan 22 is a day to celebrate and honor your actions. For everyone else, this is a day to collaborate, be an accomplice not an ally, to prioritize, act, protest, resist, raise awareness, and reach out to trans prisoners, forging new relationships and dismantling the isolation of prison. We encourage you to host a letter writing night reaching out to trans prisoners, hold vigils for those in our communities who have been taken by state violence, to plan an event, organize speakers, screen films, invite presentations, and give workshops to spread the word on the experience of trans prisoners, share knowledge, and build strategies of resistance. Have dance parties and raise funds for people and groups already doing amazing work. Take action. Let’s join together and show our conviction in supporting each other and ending prisons once and for all. This international day of solidarity was initiated by Marius Mason. He is an imprisoned transgender anarchist, serving 22 years for acts of eco-sabotage. Marius is incarcerated at Carswell in Fort Worth, Texas, a small, high–security facility; he receives few visits, his mail is monitored, and he is intensely socially isolated. Since he came out, he has engaged in a painfully slow process of medical screenings to see if he will be permitted to have access to the WPATH standards of care for transgendered people (hormones, surgery, and the right to legally change his name to a gender-appropriate one of his choosing). At https://transprisoners.wordpress.com you can find this years J22 zine packed with art and texts for and by trans prisoners. Put together by comrades from Austin ABC. You can also find other resources and also addresses for other trans prisoners on the webpage. 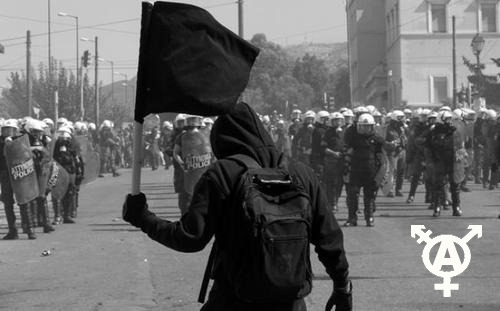 Solidarity, mutual aid, anarchy. Until everyone is free. Next Post:Support manifestation for detained and imprisoned comrades in S:t Petersburg and Penza!